I had mixed feelings when the Savage Wolverine series was announced a couple of months ago. On one hand, hell yeah, it’s another Wolverine book; on the other hand, though, oh, it’s another Wolverine book. Wolverine has had a long publication history and may well be one of Marvel’s most recognizable characters. With the Marvel NOW movement in full swing, Logan is not only starring in Savage Wolverine (written by Frank Cho) but is also set to appear in the fifth volume of his title series, Wolverine (written by Paul Cornell). In Savage Wolverine #1, we find Logan mysteriously stranded on a remote island in the Savage Land. After doing some of what he does best, he meets up with Shanna the She-Devil, who explains to him that they are trapped on this extremely hostile island. Logan, being the one-track minded person that he is, immediately agrees to team-up with Shanna to do whatever it takes to leave. That’s all well and good, but the plot, however, isn’t my biggest concern with this first issue. While Frank Cho errs in portraying Wolverine with words, he succeeds immensely with his artwork in this issue. The drawings are clean and detailed, though, unfortunately, do not even begin to make up for the mishaps in the writing. 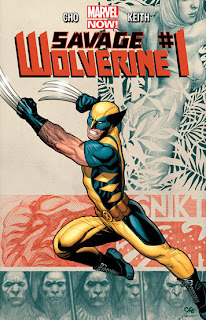 Without a doubt, James “Logan” Howlett is one of my favorite superheroes of all time, and it takes a particular type of person to be able to portray Wolverine in a way that I find satisfying and true to my perception of the character. The Logan written in this first issue just does not seem authentic to me. While Cho does have some highlights in his writing, most of it just seems try-hard and forced so far. Given more time with the character, I think Cho will eventually be able to create a more familiar Wolverine for long-time fans, but this imposter in the first issue is certainly not him.